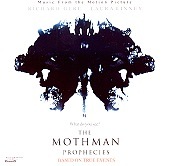 The Mothman Prophecies, starring Richard Gere and Laura Linney, is based on true events about an eight foot "mothman" that comes to a town and predicts death and destruction, as the town watches in horror as the predictions come true. Then the predictions and disasters stopped and nobody has seen the mothman since - until recently. I haven't seen the movie yet, but with Low and tomandandy collaborating on two songs, King Black Acid adding seven of their songs, and tomandandy's scores (disc two), the soundtrack is an eerie, atmospheric record that will send shivers down your spine. It will also have you thinking about the mothman as the music and images run wild in your head. Low's two songs with tomandandy are both beautifully layered, pop-oriented swirling dark pyschedelia, but it is King Black Acid's tracks that make this disc one dark, mysterious, and haunting. Daniel Riddle's ability to write spacey, sonic numbers, songs that attack your senses and mind, come alive as he and his band deliver on the name King Black Acid and send you through a dark world of mind altering sound visuals and plenty more to feed off of. Disc two, tomandandy's original score for the movie, lives up to what King Black Acid layered down on disc one, as they create musical black ice, spooky sounds and suspenseful buildups that hit you when it's too late. For the most part, soundtracks are released separately from the movie score, and rarely do the two make much sense being together. Here, though, Low, King Black Acid, and tomandandy's music all work together, leaving you in chills as you explore along with the music only to bite your nails in anticipation. I'll give it an A.